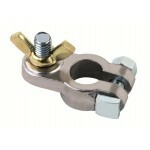 Lead Marine Battery Wing Nut Terminals / Pos. 3/8" - Neg. 5/16"
Lead Marine Battery Wing Nut Terminals Set, Positive stud 3/8" and Negative stud 5/16"
Terminals are solid Lead, wing nuts are Brass plated.